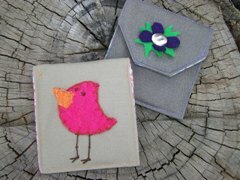 Tricia from Made by Me shares a tutorial for this easy credit card wallet with a cute little birdie applique. (She shares the template for the applique as well!) This would be such a fun project for a beginning sewist! Go to the tutorial. Thanks for sharing the pattern and template.